While BMW cars have spent the last two decades moving away from the inline-six that made them so famous, it looks like BMW motorcycles are soon going to adopt the configuration for a production bike. BMW says that an inline-six is particularly suitable for use in motorcycles because they offer, “not only supreme smoothness and refinement, but also superior power and performance as well as a truly emotional driving – or, in this case, riding – experience. A further point is that the typical sound of a straight-six almost like a turbine is absolutely incomparable, with straight-six power units at BMW having stood for fascinating engine technology in BMW cars for more than seven decades.” The company says to expect power in the 175 HP range for a 1.6-ish liter inline-six, while torque will far exceed that of the 1.3 four-cylinders. BMW’s talking about 96 Lb-Ft at 2,000 RPM and presumably far more as the revs climb towards the 9,000 RPM redline. While the concept bike this engine is being shown in is a bit of a non-event (it’s a K1300R with some plastic bits tacked on), check out the three huge exhaust outlets grouped on each side of the bike ahead of the rear wheel. If those aren’t enough to make you want a motorcycle, we don’t know what will. Enjoy your torque-free, rattly V10s, over-complicated twin-turbo V8s and passion-free diesels BMW car enthusiasts, we’re getting this inline-six in a big, comfy touring bike, probably in the next two years. Fascination, Supremacy and Riding Comfort with Six Cylinders. Munich. Six-cylinder power units have always had particular appeal, offering not only supreme smoothness and refinement, but also superior power and performance as well as a truly emotional driving – or, in this case, riding – experience. A further point is that the typical sound of a straight-six almost like a turbine is absolutely incomparable, with straight-six power units at BMW having stood for fascinating engine technology in BMW cars for more than seven decades. Looking at motorcycles, inventive engineers have also tried time and again to offer the enthusiast the thrilling concept of a straight-six power unit. 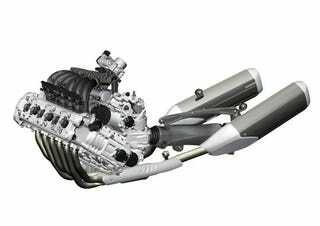 But while a few engines in straight-six configuration have indeed been fitted in motor­cycles both lengthwise and crosswise, the straight-six has never really made a genuine breakthrough neither on production models nor in motorcycle racing. Depending on the way the engine was fitted, six cylinders in-line inevitably made the engine either very long or very wide, creating disadvantages in terms of the running gear, weight distribution, and the centre of gravity. A further drawback was much higher engine weight usually setting off the benefits of extra engine power. The BMW Concept 6 now proves that a straight-six, benefiting from the most advanced construction and production technology, may offer not only unique prestige, but also a supreme standard of riding dynamics. The new BMW straight-six will further expand the K-Series in the foreseeable future. The first model to be introduced will be an innovative and luxurious BMW touring machine. Reflecting the tradition of the BMW K-Series, this will of course be a genuine top-of-the-line product. Highly compact and dynamic six-cylinder. The starting point for this dynamic introduction of the straight-six in the new Concept 6 from BMW Motorrad is of course the extremely compact form and configuration of the engine. The power unit is approximately 100 mm or 4" slimmer than all former straight-six production engines and only a bit wider than a large-capacity straight-four with conventional technology. The reduction in width is achieved in particular by the slightly over-square bore: stroke ratio with relatively long stroke and very small gaps between cylinders. To achieve this very compact configuration with minimum width, the electrical ancillaries and their drive components are positioned behind the crankshaft in the open space above the transmission. High-tech lightweight construction in all areas serves to make the power unit relatively light from the outset, important components in this context being the two hollow-drilled camshafts and the very light connecting rods. The perfect compensation of masses ensured by the configuration and layout of the engine avoids the need for a balance shaft and its drive elements on the new straight-six, which again means lower weight and enhanced running smoothness. In its layout, the straight-six featured in the Concept 6 follows the well-known straight-four in the K 1300 model series, again coming with cylinders tilted to the front by 55o. This ensures not only a low centre of gravity, but also very good weight balance as an element essential above all under sporting conditions for precise feeling and clear feedback from the front. A further advantage is that the tilted engine provides extra space for the aerodynamically positioned intake manifold directly above the engine and allows ideal configuration of the frame profiles following the flow of power. The straight-six featured in the BMW Motorrad Concept 6 comes with dry sump lubrication. Apart from greater reliability even under extreme conditions, dry sump technology serves to keep the crankcase particularly low and flat, with the engine being fitted lower down and masses concentrated around the centre of gravity. Doing without an oil sump, the engine may be positioned far lower than on a conventional layout. The oil reservoir is provided by an oil tank integrated at the rear of the engine block. This avoids the need for a separate tank, again helping to make the entire power unit more compact and reduce weight to a minimum. Maximum supremacy in running refinement and performance. Designed and laid out as a straight-six, the engine also opens up new dimensions in motorcycling in terms of supremacy, power reserves, performance and running refinement. Output of the new six-cylinder will be in approximately the same range as on BMW’s 1.3-litre straight-four power units. Torque, on the other hand, will be right at the top of the range, even in comparison with the largest motorcycle engines, such superior power and muscle coming inter alia from engine capacity of no less than 1.6 litres. The engine’s power and performance characteristics are equally impressive, offering 130 Nm or 96 lb-ft of torque from just 2,000 rpm and at the same time revving up almost to 9,000 rpm – a dynamic potential quite unparalleled in the tourer segment. This alone qualifies the engine of the Concept 6 as the ideal power unit for a wide range of different motorcycles. Environmental compatibility and all-round economy re-defined. The Concept 6 shows the absolute supremacy of its six-cylinder drive system also in ecological and economic terms. Fuel consumption of this six-cylinder naturally equipped with a fully controlled catalytic converter is lower than on a comparable four-cylinder under normal touring conditions. The use of E-gas technology (ride-by-wire) then offers further potentials for enhanced fuel economy and riding dynamics throughout a wide range of different riding modes and conditions. And last but not least in this context, the straight-six power unit featured in the Concept 6 offers long inspection intervals through the use of cup tappets controlling the engine valves. Dynamic and powerful design in Café Racer style. Supremacy and dynamism are also borne out clearly by the thrilling design of the Concept 6 and, as usual, this project from BMW Motorrad is more than “just” the attempt to develop a motorcycle of a kind never seen before. Working on Concept 6, the designers at BMW Motorrad have therefore focused yet again on technical function and quality and, in particular, the emotional element bringing together man and machine. Their rule, quite simply, is that a motorcycle must not only follow the laws of functionality, but also arouse emotion in all its facets. In a nutshell, therefore, the machine must be simply thrilling. Precisely this is why the design of the Concept 6 focuses in particular on the powerful straight-six engine as the heart of the machine. Conceived as a mixture of classic and modern styling elements in motorcycle construction, the Concept 6, with its long front end and short rear, takes up the design language of the legendary Café Racer. Powerful and muscular, the body elements extend around the power unit finished in a special platinum colour, presenting the engine almost adoringly from every angle. Smooth and soft lines ensure fully organic integration of the power unit within the machine, while at the same time they create a powerful, exciting and dynamic contrast to the sharply contoured front and rear ends. The so-called Split Face, a well-known design element of the latest models from BMW Motorrad, extends smoothly from the front of the fairing all along the top of the fuel tank made of carbon-fibre, again confirming the high technological standard of the Concept 6 and forming an exciting contrast to the outer shell in aluminium with its white layers. The division into three sections created by the Split Face is further accentuated at the front by the LED headlight integrated longitudinally in the machine in its rod shape and by the slender LED rear light extending far up into the seat hump. The powerful and supreme character of the Concept 6 is also underscored by the six-chamber exhaust system complete with sidepipes and the strong presence of the intake ducts again finished in platinum look. Aerodynamic components such as the twin-tipped engine spoiler and the air guide elements derived from the design of the new S 1000 RR Supersports, on the other hand, bridge the gap between functional and clearly visible technology, on the one hand, and the soft and smooth design of other body elements, on the other. The suspension of the BMW Motorrad Concept 6 is built around a light-alloy bridge frame as well as Duolever and lightweight Paralever arms holding and guiding the wheels front and rear. Seventeen-inch HP forged wheels as well as the extra-large brake system with its six-piston fixed callipers emphasise the sporting look of the new machine and its high level of technology. The outstanding supremacy of the Concept 6 and its drivetrain is also reflected by details such as the instrument panel intentionally kept in minimalist design but nevertheless completely equipped with all the instruments and gauges required. While a digital display performs its usual function of clearly presenting road speed, there is intentionally no rev counter on account of the supreme flow of power at all speeds. So instead of a conventional rev counter, a LED display shows the rider at all times how much torque is readily available whenever required.